Jawaher Noor (right), of Quincy, and Nechka Mars, of Hyde Park, shared a laugh at the luncheon. Noor is originally from Somalia and Mars from Haiti. Inside the Great Hall at the State House on Tuesday, immigrants were welcomed with open arms. Hundreds of people from around the world gathered and shared a hot meal, listened to personal stories, and were offered a bit of hope that everything would be OK, that America would be OK. 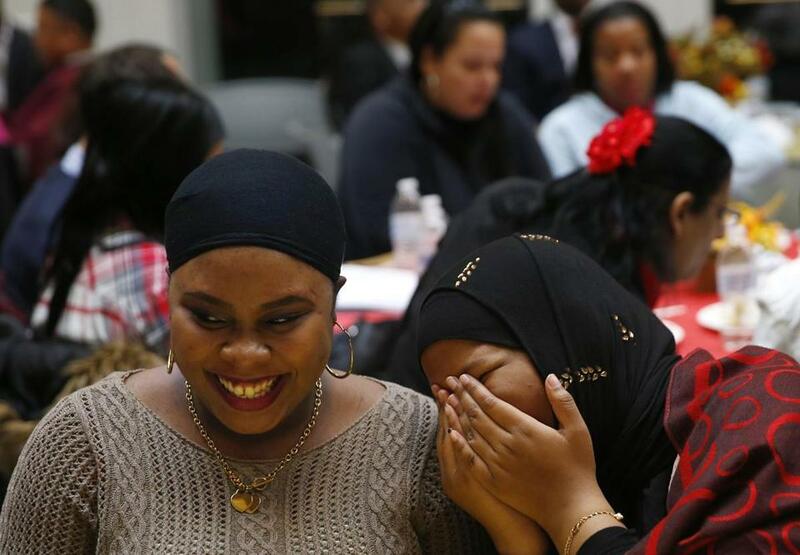 It was the Massachusetts Immigrant and Refugee Advocacy Coalition’s 12th annual Thanksgiving luncheon, and it came a week to the day since the election of Donald Trump, a week that has bristled with protest and poisonous words. Those seated at the luncheon hailed from China and Somalia, from Haiti and the Dominican Republic. They were surrounded by immigrant advocates, state representatives and senators, and teachers. Melanie Marcus, an English as a second language instructor with an organization called South Boston en Accion, spoke with a few of her students. Thomas Alexis, 37, of the Dominican Republic, listened as Marcus pointed toward Massachusetts Attorney General Maura Healey, who made her way through the crowd, introducing herself, and asking people where they were from. “She is in solidarity with us,” Marcus told those around the table. Last week, following the presidential election, Marcus’s students struggled to process the results. “I tried to make them understand that not everyone who voted for Trump hates immigrants,” Marcus said. This fear was familiar to many in attendance, including Alexis. “A lot of people are afraid of Trump,” Alexis said in Spanish. “But I’m not afraid. There are many things he cannot do. I’m telling them to be calm. Healey emphasized her role in using the laws to protect their rights. She offered a simple, but poignant message: You are not alone. “I stand with immigrants and immigrant communities,” Healey said. This week, the attorney general announced the introduction of a hot line for reports of harassment and discrimination. She read the phone number out loud and told the group they could come forward without fear of reprisal. Her office would also be vigilant and keeping a close eye on what Trump’s administration proposed, she said. Alejandra St. Guillen, director of Mayor Martin J. Walsh’s Office for Immigrant Advancement, spoke on behalf of Walsh. She smiled as she looked around the room. Outside the great hall, Nicole Lin, 35, originally from China, ate with others. She found the topic of Trump and the issue of racial discrimination distasteful. Nearby, Patricia Merlos, who works with a program called Roca that helps high-risk young people find work and learn life skills, said her 10-year-old helped her after the election. Through Roca, Merlos worked with Zulma Mestanza, 24, of Revere. Mestanza is one of thousands protected by the Development, Relief, and Education for Alien Minors, known as the Dream Act. She wants to be a nurse. She came to the United States as a little girl with her sister from El Salvador. This country is the only one they’ve truly ever known. In comparison, Jawaher Noor, 20, of Quincy, arrived from Kuwait in September. Her family is of Somali descent. She’s here to study, she said. She’s learning English. She wants to be a psychologist. She loves to talk and to listen to people. A Muslim woman, she’s well aware of hateful rhetoric, though she hasn’t encountered it herself. She’s aware of what Trump and others say about the religion she loves. She misses home. She’s building a new life. She hopes people accept her as she is.